Among the many DC supervillains lending their skills to Suicide Squad next year is Digger Harkness, a.k.a. Boomerang, played by Terminator Genisys star Jai Courtney. Compared to characters like Joker and Deadshot, not much has been said about what the film has planned for the projectile throwing criminal, but he’ll be one of the individuals who is sent out on dangerous missions by the U.S. government in exchange for leniency. While Boomerang’s personality is still a mystery (i.e. will he be taken seriously or act as the comic relief), we’ve now learned that the character in the film can be described in three words: rock and roll. The production is experimenting with several looks for Boomerang, but Latino Review's El Maiymbe describes the overall ensemble as "very hard rock influenced." As an example, at one point he wears a Pantera shirt with his prison uniform and the beanie he often worn in the modern comics. Let’s see, an Australian badass who will be wearing rock-inspired clothing. Forget Tony Stark, this is the guy who should be wearing the AC/DC shirt. Like most superheroes and supervillains, Captain Boomerang’s costumes have changed over the decades. When he debuted in late 1960, he fought the Flash wearing a loose-fitting blue shirt imprinted with white boomerangs, tight black pants, white gloves, a white scarf, and a blue military cap. These days, his look is much more low-key, though still has that comic book flair. In addition to the beanie, he wears a black trench coat over a dark blue shirt, but retains the same pants and gloves. Captain Boomerang’s appearances in animation have either had him wearing the classic tight blue costume or a blend of the classic and trench coat looks. 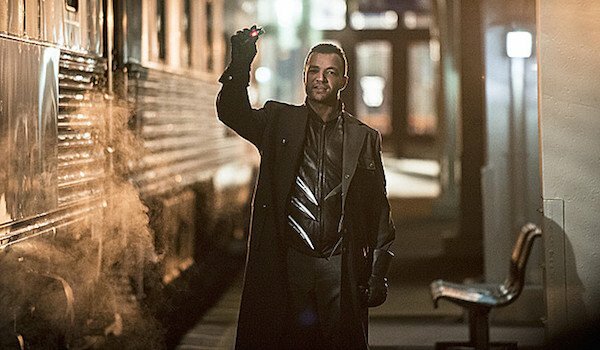 As far as live-action goes, Suicide Squad Boomerang’s only competition is the Arrow Captain Boomerang, who was played by Nick Tarabay in the Flash crossover episode "The Brave and the Bold." When he was fighting the Scarlet Speedster and Emerald Archer in the CW series, he wore the trademark trench coat, but the coloring was changed to all black. Teammate Harley Quinn has already been said to go through several costume changes throughout the film, so perhaps the same will go for Boomerang, and at some point he’ll eventually don the trench coat to go with his beanie. That being said, the most important thing is that he’s throwing those boomerangs with precision while in battle. His look is the secondary focus.